Every year, it seems like a particular flower, maybe one I've grown for decades, captures my imagination. In my gardening past, there was the summer of daylilies, when I acquired all kinds of daylilies. There was the summer of sunflowers when I sowed seeds for every sunflower variety I could find. And then there was a summer decades ago when I tried to grow every kind of easy to dry flower, like gomphrena and strawflower, I could find. I toyed briefly with gladiolus, went through a brief affair with all those different colors of coneflowers, and of course, there were those violets grown from seed. Anyway, this summer my flower affair is with zinnias. It's the SZummer of Zinnias. Four packets of zinnias was all it took, along with what seems to be the ideal growing conditions this summer. And by ideal I mean virtually no Japanese beetles have attacked the zinnias and I have yet to see any powdery mildew on any of them. The zinnias really are on their best behavior. Sure, it's a summer romance. It will only last until frost. But between then and now, there are plenty of weeks to enjoy the zinnias. Hot pink does well on zinnias. They are as tall as the okra behind them. I'd never seen such a bicolor. They are also pretty before they are fully open. And cactus type flowers, too. Clashing colors? Not on zinnias! 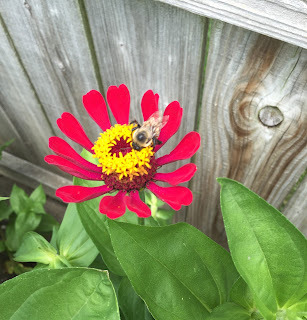 Even "red" looks good on a zinnia. Just enough petal to attract a bee. Orange you glad I showed you all the zinnias? 'Granny's Bouquet' and 'Cool Crayon Colors' from Renee's Garden (sent to me to try). In late May, I roughed up the ground a bit, sowed the seeds, and covered them lightly. When the seedlings came up, I thinned them to about six inches apart, give or take, to give them a little room. They are all growing in full sun. I never thought to label the zinnias when I planted them throughout the veg garden, so I could guess which flower came from which collection, but it would just be a guess. My plan for next year? I'm going to buy more varieties of zinnias and sow them again. Will they be just as good next year? There is only one way to find out. The SZummer of Zinnias Part II, taking place in my garden in 2017. Lovely plants. Thanks for sharing. I may just try these next year since deer are not supposed to eat them. Very cool and thanks for listing the Zinnia seed names and sources. My favorite is the one you called "fancy". To me they resemble the cactus type dahlias. So easy to grow and so wonderful as a cut flower. A close second is the white pom pom type. I love zinnias. The candy striped one is particularly pretty. I used to have a candy- striped rose bush called "Scentimental" that looked very much like it. It was not a good rose, but it had a beautiful fragrance. I will have to look for the zinnia seeds for next year. I love zinnias and finally planted some and they are doing fabuloso! They must have gotten that mildew blighty stuff because I just remember I hadn't planted them for years and years due to a problem. I really do love them And I love this post, especially telling us about all your previous plant obsessions! Zinnias have earned a prime spot in my garden the last two summers... love starting them from seed and seeing what pretty colors and forms come up! I remember planting some zinnia seeds for the first time several years ago and thinking after they bloomed, why don't I do this every year?? They are such great additions of color as summer blooms fade. You've got such a pretty selection of different varieties--I also planted 'Cool Crayon Colors' and 'Northern Lights,' two of my favorites. You should try 'Zowie Yellow Flame' next year; it's my favorite of all. I like zinnias quite a bit - and the butterflies and birds seem to like them too (although the bees seem to prefer other flowers usually). I've had big problems with powdery mildew in previous years - typically when the zinnias have to deal with summer droughts - but they seem much happier this year due to regular, copious amounts of rain.